No matter which of my windows I choose to look out of, I see eucalyptus covered hills. In many ways, this is a good thing; I love being surrounded by trees and greenery and the gentle scent of eucalyptus adds an extra dimension to walks with my dog, Daisy. And when shafts of light burst out from between their trunks, it’s like being in the X-Files. 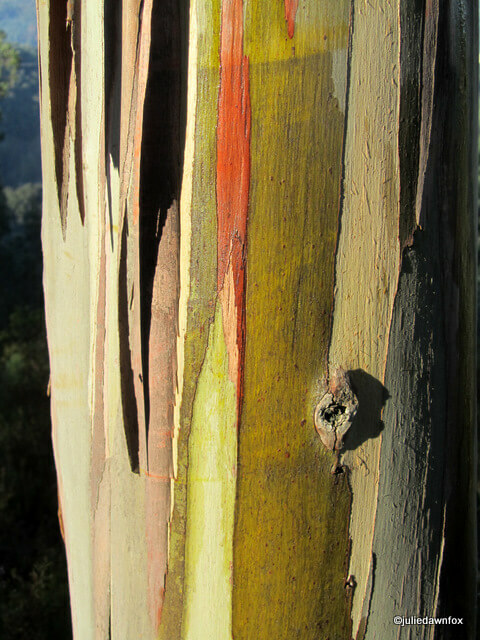 I love the patchy colours of the trunks after the outer bark has peeled away. When dry, they are a desert camouflage of sand, grey and caramel but when wet, the colours deepen to a rich green, gold and copper. The ribbons of chestnut coloured bark curling around the base of the trees put me in mind of spindly legs with tights around their ankles. I hadn’t realised until I came to this part of Portugal that eucalyptus leaves change their colour and shape as the tree matures. In young trees and regrowth, the leaves are fat and silvery green but as the tree grows, the top leaves become longer and thinner and tinged with red. The transformation from young tree to adult goes through an awkward phase where the tree has a mixture of both kinds of leaves, a bit like a gangly teenager whose body is still trying to work itself out. Eucalyptus was first introduced to Portugal in the late 18th century by Sir Joseph Banks, a British botanist who’d found them in Australia. In recent years, Portuguese farmers have covered vast stretches of land with these trees, especially in central Portugal. They’re simple to grow, three times as lucrative as cork and can be harvested within 12 years so it’s easy to see why. When cut at the base, a new tree will grow back in very little time. I can vouch for that as every year, patches of hillside turn from green to naked brown as sections of trees are harvested. Within months, silvery green bushes of leaves refill these empty spaces with colour. 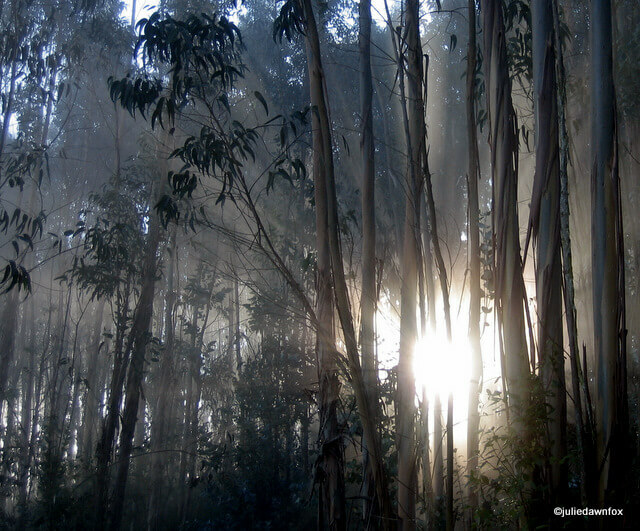 The eucalyptus grown in Portugal is used mainly as pulp for making paper. 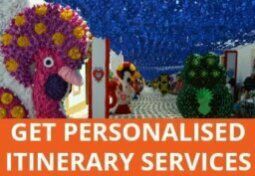 The oils and resin are also manufactured. The forested hills are scattered with rows of beehives, especially around Lousã, where the Serra da Lousã honey is produced. I admit I’m quite relieved that the beehives near me seem to be defunct; I got stung last year and it hurt. A lot. Bee stings aside, there are other reasons why not everyone is happy about the proliferation of eucalyptus forests. 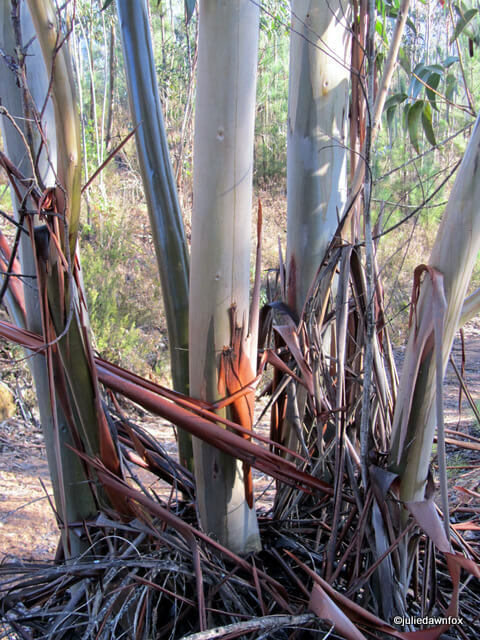 Having replaced the natural diversity of previous woodlands, the monoculture of eucalyptus trees has had an adverse effect on soil quality and on the diversity of wildlife in some areas. There’s also the problem of forest fires. The oil produced by the trees, combined with the litter created by the falling bark makes eucalyptus forests a serious fire hazard. To minimise the risk of fires spreading, farmers are supposed to clear the bark and trim the trees so that instead of four or five trees growing from one stump, there is only one. Unfortunately, this doesn’t always happen and when fires take hold they quickly devastate vast areas, turning green hills to grim bare land studded with the blackened remains of tree stumps. Being surrounded by forests is soothing most of the time but when the air is thick with smoke, helicopters are darting back and forth and the red glow of the fire is clearly visible on the hills surrounding your house, it’s pretty scary. Thank goodness for the bombeiros, the Portuguese fire service, which is heavily staffed by volunteers, and works around the clock to deal with forest fires. I have been trying to buy Eucalyptus oil in bulk, but even my family in Portugal (Tomar) have not been able to find out where I can purchase this. I need about 5 ltrs initially to treat the wood in a sauna I’ve constructed in the UK. Can you help? Sorry, I have no idea where to even start looking for this. I’m pretty sure that before the eucalypts the land had long been cleared for various other agriculture. So to compare the biodiversirtty of globulus plantations with that of the pre-human forest is fine, as long as you make the same contrast with olive groves, vinyards and wheatfield, which are monocultures as well. globulus pulp is the best you can get, and is used in the highest value prining papers. globulus leaves are well liked by Koalas, so much that new plantation of globulus in wheat and sheepbelts of Victoria Australia have been colonised by the few koalas in remnant bush and their numbers have exploded in the lush abundant foliage of the new forest. So when the hrvesters go in to harverst their trees koalas bounce. The fire ecology of drier native portuguese forests would have been at least somewhat similar to that of Eucalypts. Cork is thick bark grown by Portuguese Oaks to protect the trees against fire. 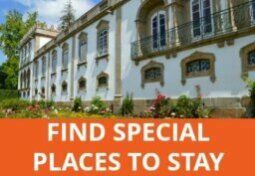 If I was in Portugal in a globulus areea, and its a blazing hot day, and the bark and leaves are deep underfoot and crunchy, and there’s a strong wind and you’re in hilly country, then if there’s a fire you are in big trouble. So best keep out of the bush when you have all the conditins except the fire. sorry for poor editing the scrolling keys are verrrry slow! This is an absolute nonsense reply; olive groves, vineyards and wheat fields by far have higher natural diversity, even when planted on a large scale. And nowhere in Portugal are those grown on the scale that Eucalyptus occurs now. Eucalyptus has completely taken over Portugal. Before the monotonous Eucalyptus stands there was a divers agrarian landscape, where the combination of different types of land use resulted in an incredible natural diversity. And the woods were way more divers, not only pines, but also various types of oaks. Ask any squirrel; they’re pretty much gone now. Small patch lands occurred, where a single owner took care of many different crops and trees. Those owners left or died and their land got planted full with Eucalyptus. There’s nothing there. Nobody takes a hike or goes bird watching there, since there’s nothing to see. In summer those plantations are terribly hot and you don’t even want to walk there. No way fires would have occurred in Portugal at the same rate as now, with the Eucalyptus plantations. These dry plantations burn like crazy. They’re oily, they have loose bark hanging and all trees are of the same size. That’s asking for trouble and rapid fire development. At least cork oaks would survive those fires, but they’ve been cut down to make space for more Eucalyptus. Once every few decades the Eucalyptus stubs need to get removed, for which the ground needs to be ploughed. This has created great growing conditions for invasive acacia species. The paper industry is also a very dirty one (i.e. https://en.wikipedia.org/wiki/Environmental_impact_of_paper). 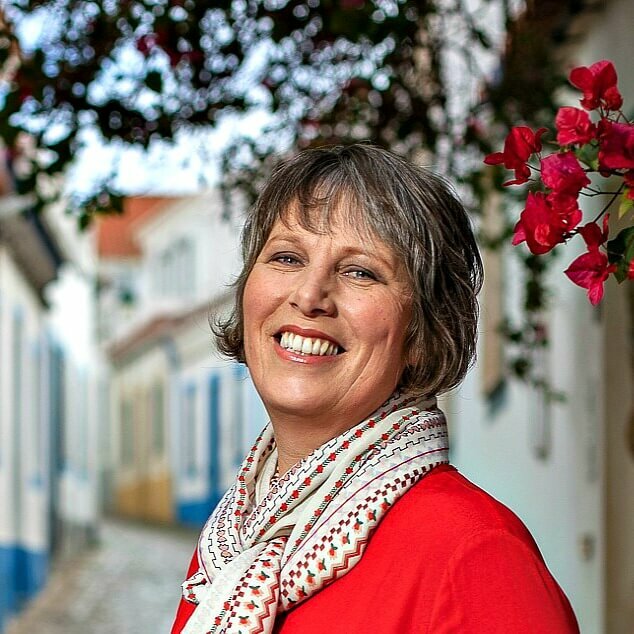 The biggest problem is that Portugal is very corrupt and the paper lobby has done its work very well over the years. Any Eucalyptus related problem never gets mentioned by name. When a Eucalyptus plantation burns down, on tv they’ll call it a forest fire. There are scientific papers published about the benefits of the industry that are full with lies. Nowadays, in Portugal no professor is even considering studying or publishing anything that will discredit the paper industry. Science has become too afraid of getting its budget cut by the powerful Eucalyptus lobby. At school children get a small Eucalyptus tree to take care of. They’re not allowed to call it an exotic tree. They call it naturalized. In not too much time from now, Eucalyptus is considered a native tree here. Next time you see Portugal burn down again, don’t feel sorry for the Portuguese. It’s their own fault. And Koala’s don’t occur in Portugal. 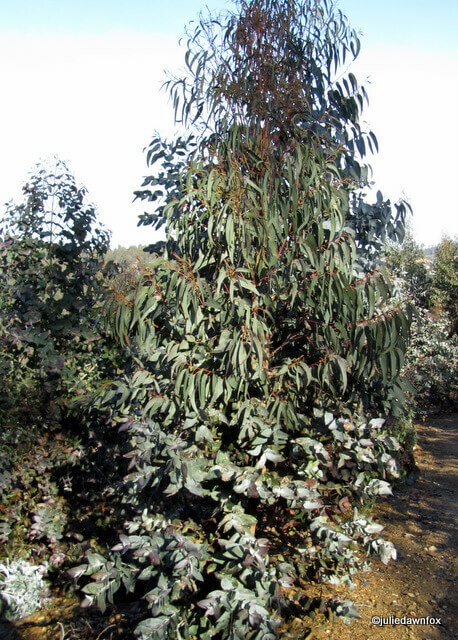 The Eucalyptus species grown there is not one they’ll eat. Thanks for helping to explain why our eucalytus tree in Georgia, USA has changing leaf shapes. You’ve got a great blog concept! Hi, can you tell me the major species of eucalypts in Portugal, not plantations for paper, but what one can by roadsides and in « natural » woodlands? 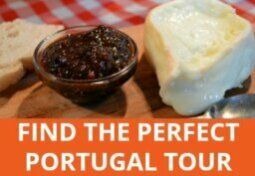 I have just found your blog, it seems great and I am always curious about foreigners opinions of Portugal. I realise that these days Portugal does not appear to produce much, other than sun, sea and sand (and other touristic things), but please don’t say that our eucalyptus forests are mainly used for toilet paper. It has been said that we produce some of the best quality papers in the World (and not for its softness), which results for the very high grade timber of our eucalytus trees. Sorry about that, our national pride is in the garbage already, I wouldn’t want it flushed down the drain. I stand corrected, Francisco. Thanks for pointing that out, although toilet paper is very useful and nothing to be ashamed of. I’ll change the text, though. that first picture is awesome. nice capture! Thanks, Derrick. It happens fairly often in early spring so I remembered to take my camera with me that day and was very pleased with the results. Fascinating! I live in the land of eucalyptus trees and your post has enlightened me on these grand trees! However, we don’t seem to get the same gorgeous colours on the trunks that you do – perhaps it’s something to do with our hot climate Down Under. Your photos are fantastic, and I specially like the first one with the shaft of light coming through the trees! That first photo is just beautiful. 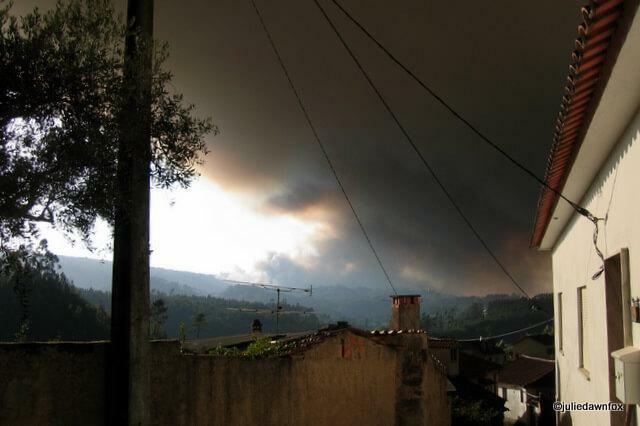 I remember fires out of control when living in the center of Portugal…A sad yearly occurrence unfortunately! Beautiful writing and fabulous photos! Julie, this may be your best post yet. It covers so many issues (forest fires- nightmare! Even in the Algarve I’ve seen that curl of smoke that turns your stomache to jelly) yet still illustrates the beauty and usefulness of these trees. Wonderful stuff! And once again thank you for the link.